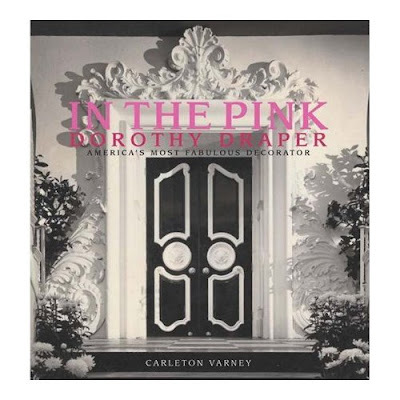 I just got off the phone with the very charming and very Irish Brinsley Matthews, director of design and operations for Dorothy Draper & Company, Inc. Brinsley tells me that Carlton Varney (who wrote the book, above, on Draper) and who did the fabulous renovation of the Draper Penthouse inside the Stoneleigh hotel, is the newly named honorary chairman of the Turtle Creek Association's annual home tour on May 3, 2009. The fabulous Draper-designed penthouse will be on the tour, naturally. Brinsley says Varney is also headed to back to the Stoneleigh in a couple of months for the Rita Hayworth Gala on November 14, which benefits the National Alzheimer's Association. Varney, the gala chairman, came up with idea of naming it after Hayworth to give the gala a bit more glamor. Hayworth died from Alzheimer's, and her daughter, Princess Yasmin Aga Khan, is flying to Dallas for the party and will be staying in the Dorothy Draper Suite, says Brinsley.